Sounds so magnificent and royal, right? Well, that certainly they are. 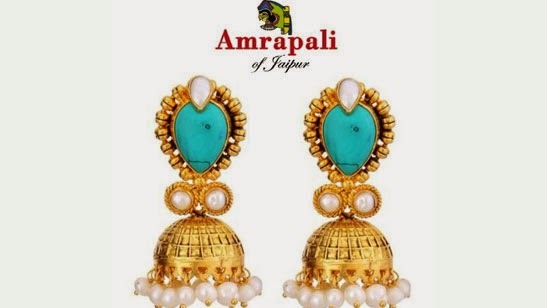 Amrapali designs are basically tribal, fine and uncut gemstone jewellery. Their inspiration lies in elements of ethnic jewellery. Also, it is made keeping in mind traditional methods so that the designs are authentic and closer to our rich culture and heritage. Since it was unique and traditional it was mostly sought after by the royal families and more recently film stars and the Richie rich of the society. The Concept is the brain child of two talented designers Rajiv Arora and Rajesh Ajmera. They chanced upon it during their graduate program as it was part of their project. These two gentlemen took upon the responsibility of sharing the magic of this jewellery to the whole world and spread its charm and glory. Well, they did a fine job and The House Of Amrapali over the years has earned a loyal clientele from Maharani Gayatri Devi, Angelina Jolie, Jennifer Lopez, Aishwarya Rai Bacchan, Kareena Kapoor to name a few. What started off as a graduate program for two young designers made its way across the globe starting with The Oberoi Hotel in Mumbai. There couldn’t have been a better platform for these jewels to be showcased as Mumbai was growing fast to become a financial hub. Not just globally it would get delegates and foreigners visiting but India’s top honchos and Socialites would also be regular visitors. Do you own your own Amprapali? Do share your pics and on what occasions do you prefer to wear your precious jewellery? Next Post Some Chic Ways To Cover Your Swim Wear!